X_TRADER Pro users with the proper Staged Order credentials in TT User Setup, (i.e., Staged order creation allowed is enabled) may create staged orders from the Market Window Order Pane or the floating Order Pane. Selecting the Stage check box routes the staged order to the Synthetic Strategy Engine. The following screen shot illustrates a staged order to buy 500 ES that includes execution instructions. The originating user did not include a price, meaning the execution trader has discretion to work the order based on their assessment of market conditions. When Stage Internal is checked, the order is routed as an internal staged order to another TTORD Trader typically on the firm's internal execution desk. When Stage Internal is unchecked, the order is routed as a "Broker" staged order to the Direct Trader to whom the TTORD Trader is mapped. The Stage Internal checkbox is not available to Direct Traders. However, Direct Traders can create staged orders and share them with others in their shared group. Prior to X_TRADER 7.17, this was referred to as "Broker" staged orders. The staged order may also include optional execution instructions advising execution traders of desired intentions beyond instrument, quantity and Buy/Sell direction. It also includes a routing choice for the internal execution desk or the external broker desk. Note: Although originating users may request certain order parameters, they cannot require the execution trader to enter any particular order type. Execution traders will enter child orders at their discretion based upon the current market conditions and their market experience. X_TRADER Pro users may create new staged orders with any or all available order parameters, including synthetic parameters. Staged orders are for single exchange-traded instruments only. Therefore, you cannot stage Autospreader orders. Open the product for which you want to create a staged order in the Market window. Add the order details you want to include. Click the Stage check box. Note: Routing Rules cannot be used with staged orders. 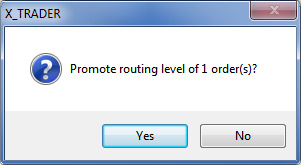 If the Stage checkbox is disabled, ensure that a routing rule is not selected in the Routing Configuration dialog box. Click the down arrow to the right of the Stage check box and enter free-form execution instructions. 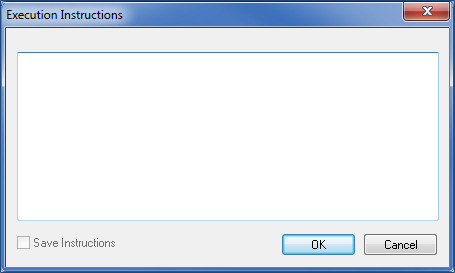 (Optional) The Execution Instructions dialog box appears. Click the Save Instructions check box if you would like to save the execution instructions for future use. Note: When this option is enabled the instructions will be saved and the Stage field on the Order Pane displays a green background. Open the Routing Configuration dialog box and select the desired routing options, (e.g., Broker/Order Gateway, customer, etc.). Click OK to close the Routing Configuration dialog box. Upon successful submission to the Synthetic Strategy Engine, the Orders and Fills Window Orders Pane displays the staged order in the Working (W) state. The staged order will remain in this state until it is partially filled (P), entirely filled (F), deleted (D), or Canceled (C). Tip: The Link Type column can be used to filter staged orders from the other orders in the Orders Pane. The Audit Trail logs actions and events relating to staged orders. Execution instructions are also displayed when Process and display INFO messages is enabled on the global Properties | Audit Trail tab. Staged orders do not display in the Market Window, Spread Matrix, MD Trader, and Order Book. However, these windows do display related child orders. Execution traders on an internal buy side desk may sometimes need to pass a staged order on to their external broker for further trade management and execution. Traders that are set up as TTORD IDs may promote owned staged orders to the registered trader they are mapped to by clicking the Promote button. Warning! : Once a staged order has been promoted it cannot be unpromoted. After clicking the Promote button, confirmation will be required if a confirmation method is enabled on the global properties Orders tab. When the staged order is promoted the Link Type changes from Internal to Broker; the TTStatus field and current State do not change. 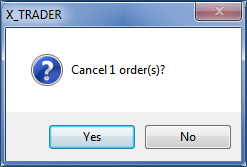 The TTORD trader can continue to monitor the order in the Orders Pane and even cancel the order. However, the TTORD trader cannot re-claim the order once it has been promoted. Click to select an owned staged order displayed in the Orders Pane. The originator, the owner, or users with administrator permissions can cancel the staged order while it is in Working (W) or Partially Filled (P) state. Canceling a staged order that is partially filled, submits cancels to the exchange for all currently working related child orders. Upon acknowledgement of the cancel the staged order is moved to the Cancel (C) state and the staged order and all related child orders are canceled. Canceling a staged order that does not have any fills, submits cancels to the exchange for all currently working related child orders. Upon acknowledgement of no fills, the order is moved to the Deleted (D) state. If the owner cancels a related child order, the staged order remaining quantity increases by the amount of the child order quantity canceled. Standard order book sharing applies to child orders (i.e., traders sharing an order book can cancel related child orders). Warning: Synthetic SE does not enforce the Time-in-Force of the staged order. The parent staged order remains in an active state on the Synthetic SE until it is either fully filled Cancel_Staged_Orderor canceled. Click to select the staged order in the Orders Pane. Click the Cancel button. If you have a confirmation set up, the confirmation dialog box appears. Click Yes to confirm. This cancels the staged order.